Be honest—if you could choose to keep your privacy and stay anonymous after winning a large sum of money, you would. After all, no one wants to be hounded by a long line of people expecting for a handout—or, worse, be targeted by criminals. Unfortunately, most people can’t stay anonymous as a lot of lotteries (and states, for that matter) require winners and their identities to be declared publicly. In China, however, things are a lot different. There, lottery officials actually insist that player privacy be protected in a bid to keep them safe from undesirables looking to take advantage. Of course, winners still need to collect their prize in person and pose for publicity shots. But creative people proved that this obstacle was nothing more than a slight inconvenience. Chinese lottery winners have devised a clever way of keeping their privacy while still adhering to their lottery’s rules: wearing quirky costumes! From wearing full-blown outfits or masks of well-known characters to becoming anthropomorphic animals for a day, Chinese lottery winners have been using this tactic to hide their identities for at least two decades now. But wearing colorful costumes is just the tip of the iceberg—their stories are just as interesting! In 2011, a man who has been consistently playing the lottery for more than a decade finally won big. 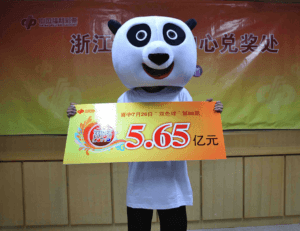 However, because he wanted to protect his privacy, he decided to don a giant panda helmet when he went to claim his RMB 565 million (or around $88.5 milllion) lottery prize. Surprisingly, that’s the least interesting part of this story. For starters, it took him 34 days to come forward after his win was announced—not because he was deciding what to wear, but because he forgot to check if his ticket had won. Even more amusing is how he chose his lucky numbers: he got up at 6am and ate breakfast at 7am—which, by the way, cost him RMB 9—so he decided his lucky numbers were 6, 7 and 9. That’s one lucky panda right there! 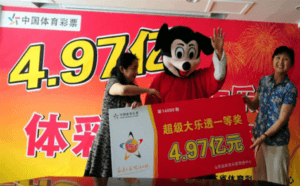 Back in October 2014, Mickey Mouse became richer by RMB 497 million (or almost $80 million)—or at least, someone donning a poor costume of the world-famous mouse did. Not content on simply wearing a costume, the person inside even went as far as using a voice changer to completely mask his/her identity! Talk about dedication. The most interesting thing, however, was the fact that the lottery winner generously donated RMB 20 million to help people in need, thereby granting tons of strangers a Disney happy ending. Mickey Mouse wasn’t the only lottery winner in October of 2014, a serious-looking yellow bear won over half a billion yuan (or approx. $81.6 million)—which was the third biggest lottery prize to have been awarded at the time. The man from Shanxi routinely spent at least 20,000 yuan and as much as 30,000 yuan on tickets every year for two years! Those on a tight budget would probably cringe at how much he was spending—but who are we to judge? His persistence clearly paid off! More notably, the man expressed his desire to donate a portion of his winnings to charity, but didn’t have a concrete plan at the time. Did he push through with his plans? Absolutely—he was able to donate 12 million yuan to the provincial charity federation. Here’s another bit of good news: the shop where the Shanxi man bought the ticket came out a winner, too. Shortly after the yellow bear’s big win, the shop experienced a huge surge in customers looking to buy lottery tickets, believing that the shop itself was lucky. Maybe they’re right. 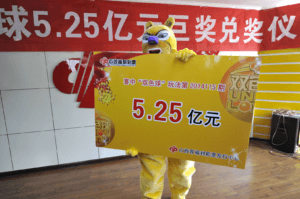 In Chengdu on April 16, 2015, a man who was believed to be in his 40’s, dressed up as lovable cartoon hero Baymax, from the movie Big Hero 6, to claim his lottery winnings. 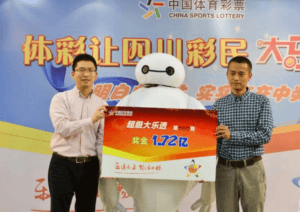 Not really a frequent lotto player, the winner of the RMB 172 million prize admitted that it wasn’t his idea to don the bulbous Baymax costume—it was his wife’s. Not one to sugarcoat his words, the man told reporters that his wife didn’t just give him the idea to wear a costume—she forced him to wear it. It was for their own good though. He revealed that his wife feared that friends and long-lost relatives would come out of the woodwork and demand handouts. Smart woman. 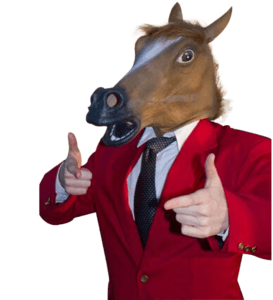 In 2015, a man dressed up in a horse mask and a hat, asked lottery officials for some plastic bags for his shoes. Dubbed by a local news outlet as Mr. Money, the man asked reporters to delete any photos they had of his shoes. You see, the shoes were given to him as a gift—and he was afraid those shoes would give away his true identity. Not Mr. Money, but you get the point. His concern was understandable—he had just won the yuan equivalent of $44 million, after all. Friendships have been ruined for far less. Interestingly, had his life not taken a fortuitous turn, his marriage likely would have taken a hit. The man had been going against his wife’s wishes almost every week for two whole years and was spending around $100 on tickets every time! Good thing his luck turned around, huh? Much like a lot of Chinese lottery winners, Mr. Money expressed his desire to use a portion of his winnings to give back to society. At the time, he had planned on establishing a $3.3 million foundation that would help those in need. Relatives urged him to use his newfound wealth for good—and he agreed. Good on him, I say. 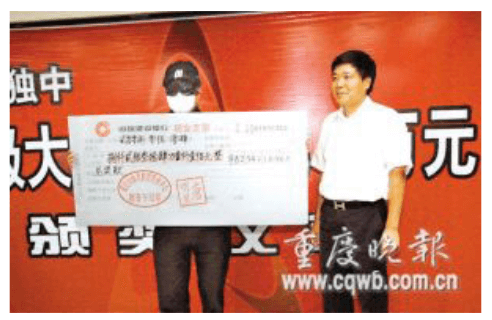 In May of 2008, a man disguised in a mask, wig, hat, and sunglasses was escorted by armed security personnel to claim his 82.34 million yuan ($11.76 million) prize from the lottery center in Chongqing. The lottery center even took added precautions in protecting Mr. Incognito’s identity. Staff members guided the lucky winner, who identified himself as Lao Yang, through a secret passage to claim his prize. They also informed local police, the bank, and other authorities of his arrival. Finally, upon claiming his winnings, Lao Yang also requested a security detail to accompany him as he deposited his money to his bank. To top it all off, reports say that the man wanted to hide his win so bad, he didn’t even tell his wife! The lucky winner obviously took his privacy and security very seriously. We only wish that he had taken the same amount of care into designing his winning costume. It might be eccentric but—admit it—donning colorful and, often, silly costumes is a pretty clever way of staying anonymous. There have been so many stories of lottery winners being taken advantage of by friends, family, and sometimes criminals due to their identities being openly divulged to the public, that it’s actually refreshing to see a culture that embraces privacy and security—all while being playful and silly. Beyond the initial novelty of the costumes, the stories of these winners are quite interesting as well, especially as they offer the tiniest of peeks into the thoughts and lives of the real people behind the masks.